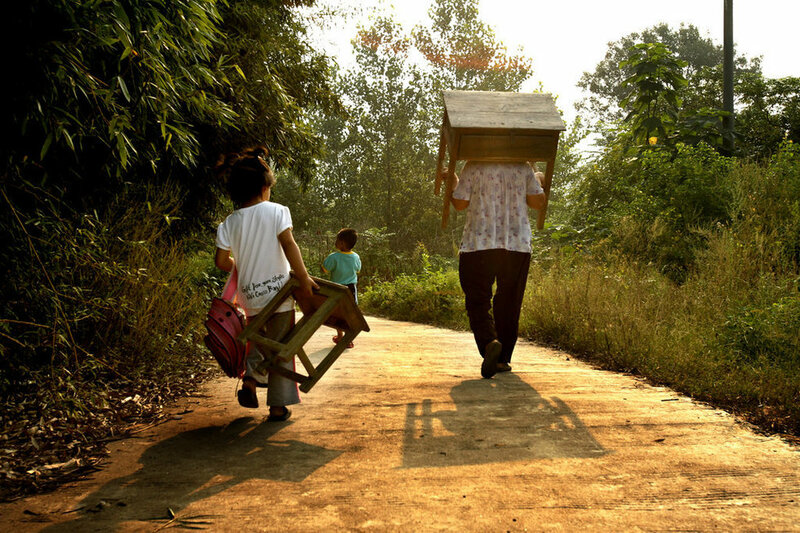 September 1, parents in Shunhe town of Macheng City in Hubei province are preparing for their children’s first day of school, and the most important thing is to bring desks to the school. At present, there are over 5,000 students in the entirety of Shunhe town. Before the beginning of the new semester, about 2,000 new desks were distributed to a Project Hope elementary school in the town and the town center school, which means there are over 3,000 children who have to bring their own desks to school as their elder generations did. 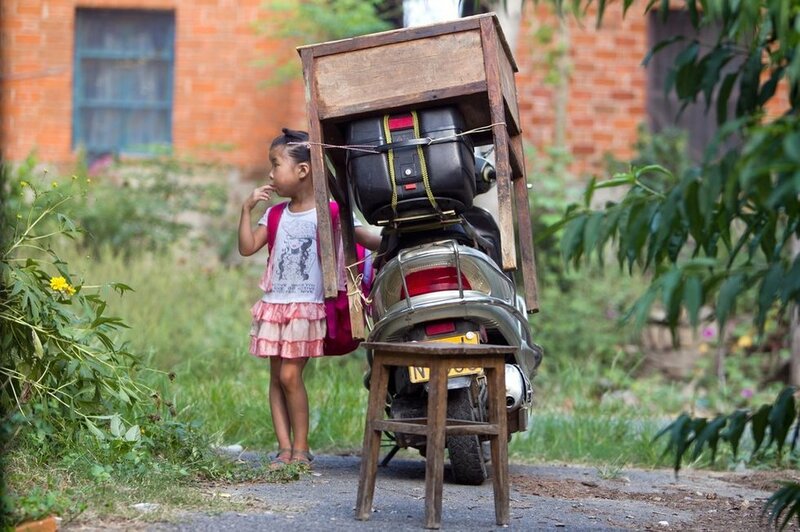 This picture is of Lu Siling’s mother has tied their own desk to their scooter, while she stands watch beside it. 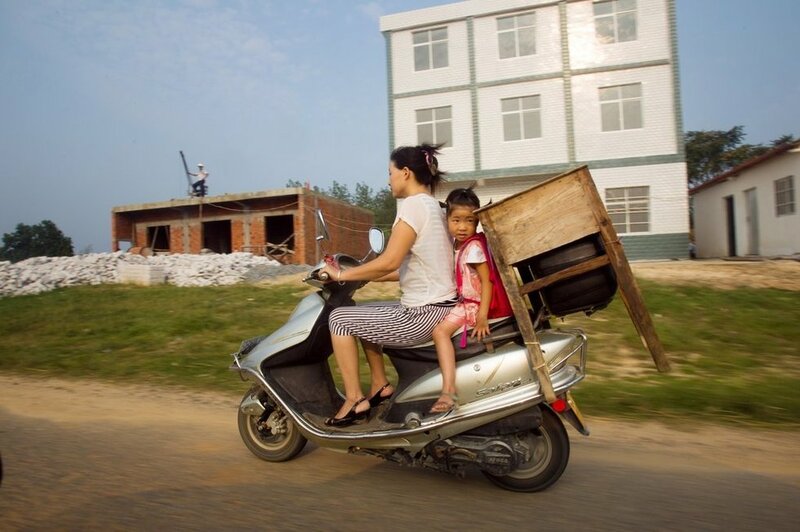 Lu Siling’s mother is riding the scooter, carrying her daughter and the desk, heading to the school which is 2.4 kilometers away. 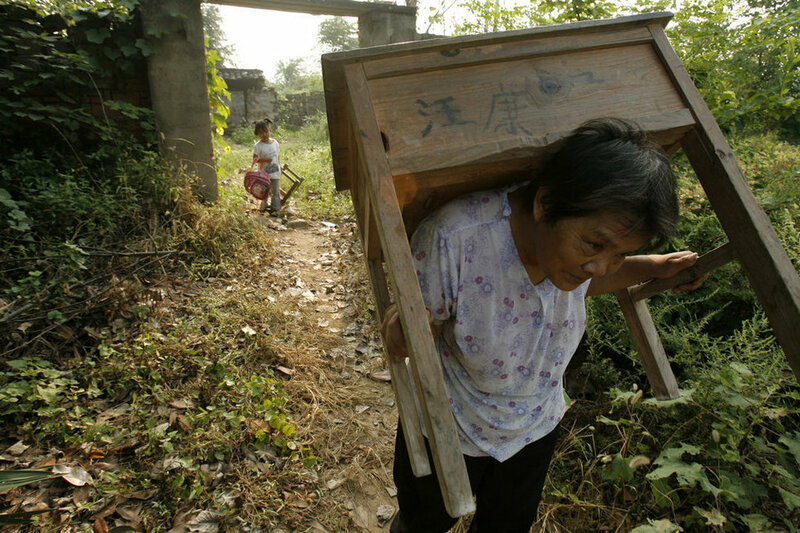 Wang Ziqi’s grandmother is carrying the desk on her shoulders while Wang Ziqi’s elder sister is carrying a backpack and a stool to send him to school. 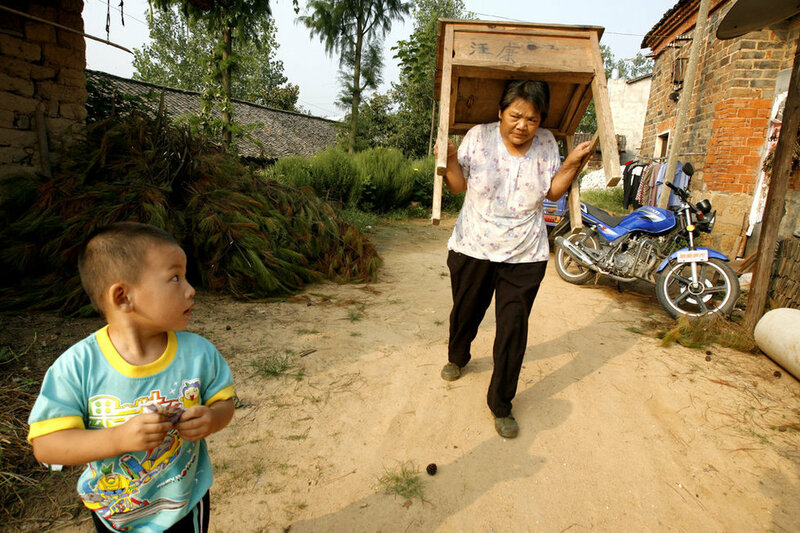 Although the straight-line distance is only a little more than 100 meters, the grandmother is already out of breath from the weight of the desk. Hubei Macheng Changchong village, due to a fight over who would get to use a new backpack where neither elder sister nor younger brother was willing to give in to the other, both were still holding a grudge even at breakfast. 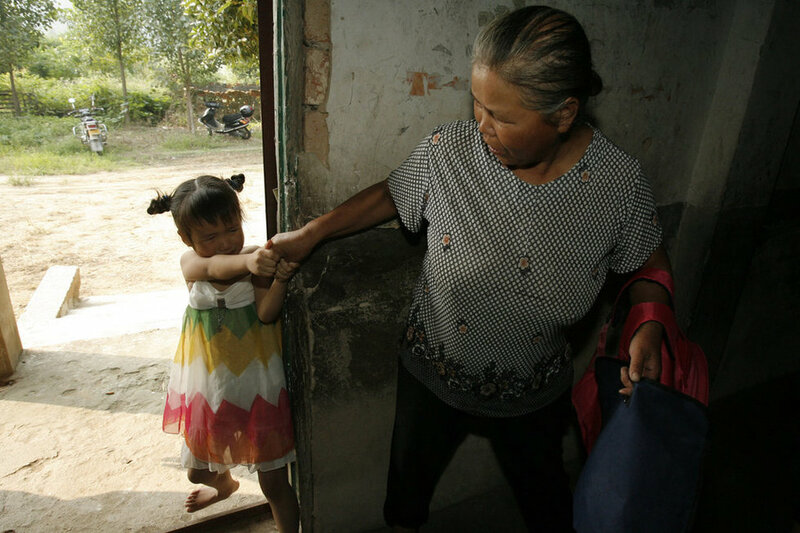 First day of school, 5-year-old girl Wang Xiulian refusing to enter the classroom no matter what. Some children who arrived early for registration with their parents paying for “tuition”. In the classroom, teacher Xiang Mingxiu is telling several registered children about safety rules. Below the platform, the varying heights of the”desks and chairs” look particularly incongruous. 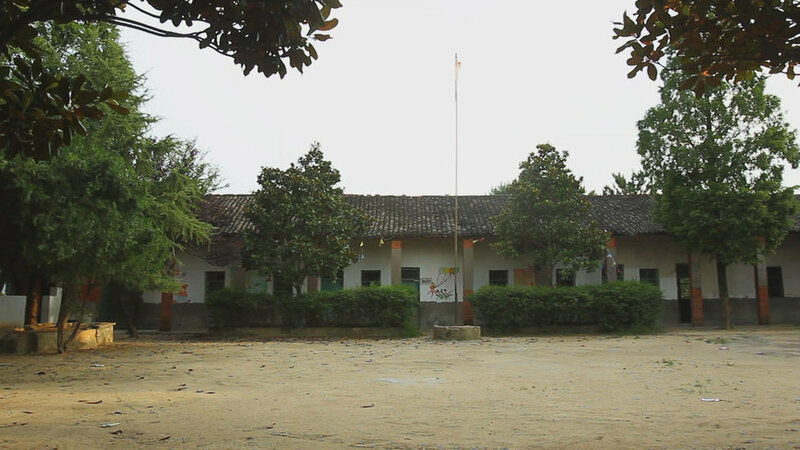 The schoolyard of Hubei Nangang Village elementary school. Seeing this makes really pains my heart! Our country donates hundreds of billions to America, why not take care of our country’s own people??? I’m from Macheng Tiemengang Village. I remember ever since 1998 our hometown has been levying road repair money from the peasants. I returned for Spring Festival this year, more than 10 years have passed, but nothing has changed, the roads are still unpaved. The only change is: I see every township cadre and committee cadre of our village is fatter than before. No matter how poor we are we can’t skimp on education, a slogan that’s found throughout our entire nation. Where did the superiority of socialism go? Merely 3,000 desks? The money our nation’s leaders spend smoking in a day is enough to make 30,000 desks. It was like this when I was an elementary school student. Now I’m already working, why is it still like this??? Seeing this, there a feeling in my heart that is hard to express! Painful! Where’s the Ministry of Education! What do we need you for when you can’t even provide the most basic desks and chairs for classes!!! Our country has already implemented nine-year compulsory education, why are they still charging so much tuition? Is there no one managing things [in accordance with the law] in these mountain areas? Tragedy! So many high ranking military officials of the New China [PRC] were from here! Yet 60 years later it’s still so poor and backwards? How would the high ranking military officials –both alive and dead– feel about this? I’ve never seen something like this before. And they have to pay tuition. Ridiculous. If those officials had one less dinner out this year, then all of these problems would be solved! 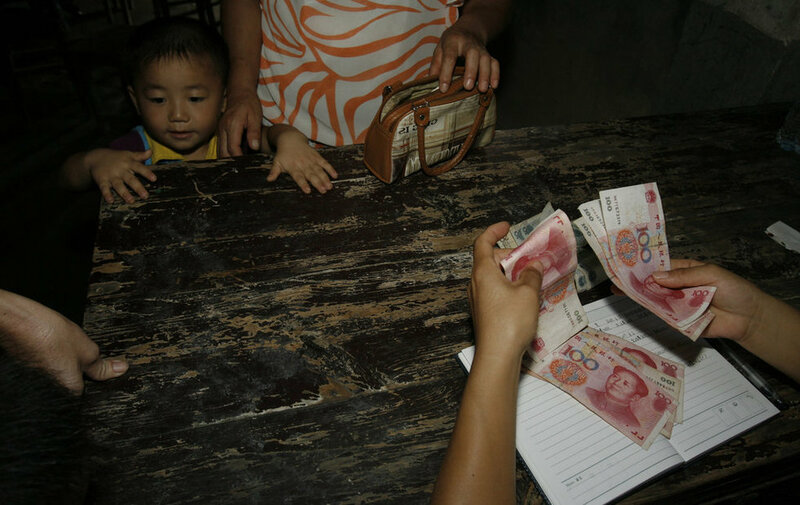 Trillions of dollars are placed in foreign banks, yet there’s no money to buy desks. The head of the province’s education bureau can step down now!!! I thought something like this could only happen when I was little. Never thought it would still be happening in 2012 today. So heartbreaking. And yet it’s funny too, that something like this can actually happen. You guys figure this out for me: how many desks can a bottle of Maotai buy? Seeing this I suddenly traveled back in time to my childhood 30 years ago. Fortunately, [at least] her mother has a motorcycle. I can only say that this country is gravely sick, shameless from top to bottom. Local officials, do you not feel ashamed?! This is the tragedy of our countrymen! If the education bureau chief doesn’t have a government car, I’ll donate 20 desks. I really have to give it up to this mysterious country, speechless~!!! Government officials only know to invest money into construction projects– easier to graft. When compared to these desks, many things that people nationwide complain about from day to night are actually little things, while no one really pays attention to the truly important things. I’ve seen too much positive on TV normally that I’m really not used to it seeing things like this. The local finance department can’t even afford desks? So dangerous, carrying both passengers and cargo together. Fire the education bureau chief!!! Think about the cars that government officials ride in, their luxurious offices, drinking Maotai and Wuliangye… while this is the situation for the vast majority of society. So deeply ashamed. What do you think? What were your schools and schooling like as a child?